Berlin, Germany. “Of course I was scared, but I didn’t have any other choice,” said Khloud Al Sultany, a 49-year-old Iraqi mother of five, about her journey to Europe. About two months ago, Khloud set out from her home in Baghdad to Europe, alone, with her four children. “My husband couldn’t come with us because he can’t walk. He had an accident and has been immobile since. The journey is very dangerous – the sea, the boat, the mountains. 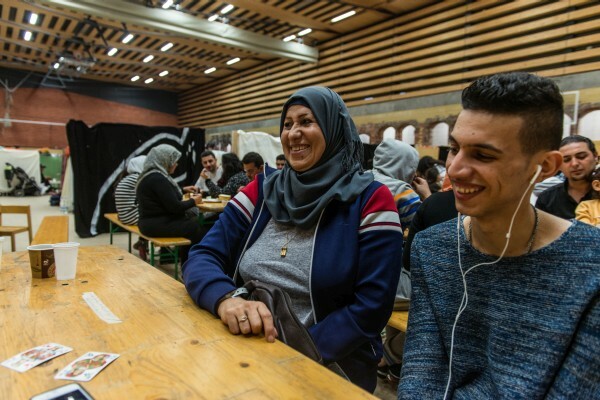 My older son just had a child, so he couldn’t make the tough trip either,” Khloud said, sitting in a basketball court-turned-emergency shelter in a north Berlin district. Sura’s mother Khloud Al Sultany (49) with her son Saif Al Najm (18) at their shelter. Photo Felix Gaedtke . Khloud and her family are five of 800,000 people who have arrived by sea in Europe in 2015. According to the UNHCR, a majority of refugees come from war-torn countries such as Syria, Afghanistan, Iraq and Eritrea. Germany, the biggest economy in the region, has so far accepted or received? over 500,000 asylum applications, more than any other country, and is expected to receive 800,000 by the end of this year. Amidst noisy toddlers and playful children on roller skates in the basketball hall, Khloud and her 13-year-old daughter, Sura Al Najm, recounted horrid memories from their travels. “We walked through seven countries. We were on the road for over 20 days. The hardest parts were on the sea. In Hungary, we were rounded up by the police. They were holding us up for three days, it was very cold,” Sura said. The family said they walked through the Greek mountains, drenched in rain with heavy bags, suffered punches at the hands of the Greek police, were duped by a taxi driver in Serbia for 100 euros, before finally arriving in Germany a month and a half ago. In 2015 alone, over 3,500 refugees are estimated to have died while crossing the Mediterranean Sea. Given the perils involved, only about 14 percent of refugees who get on the boat are women. “Most of the time women stay back with young children and let the man make the journey and get asylum first, so they can follow a few months later through a much safer route,” said Tania Lescano, coordinator at the emergency shelter. Tania added that, while most women come accompanied, there are also single women travelling in groups. 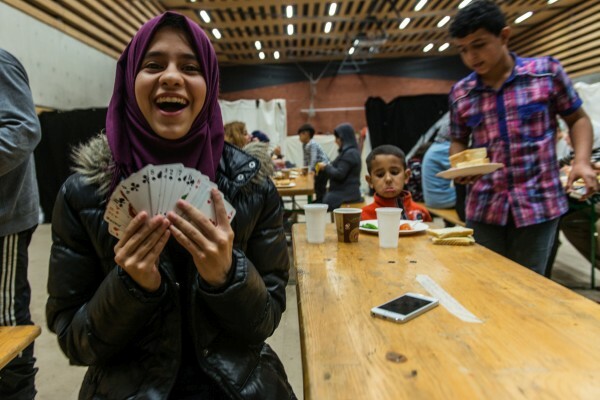 Sura Al Najm (13), a refugee from Baghdad, shows card tricks at her emergency shelter in Friedrichshain, Berlin. Photo Felix Gaedtke. Prostitution is another scary factor. According to a paper by the Henreich Boll Foundation, Syrian refugee women are especially vulnerable to forced marriages and prostitution that often happens under the guise of “sutra,” a concept of providing security and social care to a woman by marrying her. “It is obvious that women moving in these “illegal” patterns means that no one has real control over what is really happening to them,” Tania said while volunteers in the camp began preparations for dinner. According to the German government, currently, the process for seeking asylum in Germany takes 5.3 months. With limited infrastructure and availability of resources, there aren’t many special services that cater to the needs of women in refugee homes or emergency shelters. “Many camps have safe spaces for women and we are also working on such a room. Here, we have not had bad experiences yet. But often women face a lack of privacy – they don’t want to be looked at by men. They hide behind curtains built out of bed sheets around their beds. But in this camp, the relationship between men and women is much better, since there are a lot of dads around,” Tania said. At a youth center, a few miles east of the emergency shelter, over 50 people gathered to watch a theatre play called “Alice in Wonderland,” on a previous evening the same week. The actors in the play were teenage girls seeking asylum in Germany. At the start of the show, the lights went out and performers with head torches around their necks entered the room shouting demandingly, “Passport… identity card… Passport… ID … ” at the audience. For the next 20 minutes, the play highlighted the daily trials and tribulations of the girls. “I have been here for four months. In the beginning, I think people here thought I wasn’t a good girl. I didn’t speak any German and nobody would speak to me. But after starting the theater work, we would speak, we would dance together, and we went to the Baltic Sea for three days, and that was wonderful and now we are all friends,” said Sedina Lonić, a 17-year-old from Bosnia and one of five performers at the show. “I came here with my mother. My parents have divorced. My mother doesn’t work any more and can’t pay for my school or for me. I want to study medicine. In Bosnia there’s no work and when you’re a doctor, you still don’t earn enough money,” Sedina said, while sipping on cola in a café close to her house, a couple of days after their performance. Sedina Lonić (17) with her friend and co-actor Tamara Sablic at a cafe close to their refugee home in Wedding, Berlin. Photo Felix Gaedtke. Sedina is unsure about her future. Over 60 percent of asylum applications from Bosnia in Germany were refused last year. Moreover, last year the German government declared Serbia, Macedonia and Bosnia “countries of safe origin” and this past September, the EU proposed to add Montenegro, Albania and Kosovo to the list. Three of Sedina’s friends in the play are from Balkan countries. “At the refugee homes, one of the biggest challenges is that you don’t know how long the participants will stay. The children are always worried because they don’t know that either. They are not free. And so, they have issues with identity,” said Mirella Galbiatti, a facilitator who helped create the play. “For instance, if you want to talk about gender identity, as a participant, I never feel completely at ease, because my background and history are always at the back of my mind”, said the 41-year-old Argentinian theatre professional, who has been using this medium as a tool for social change for over 15 years.